Indeed, before we shared our description of the Deal with survey participants, we first asked them how much, if anything, they had heard about it. Very few people had heard about it. 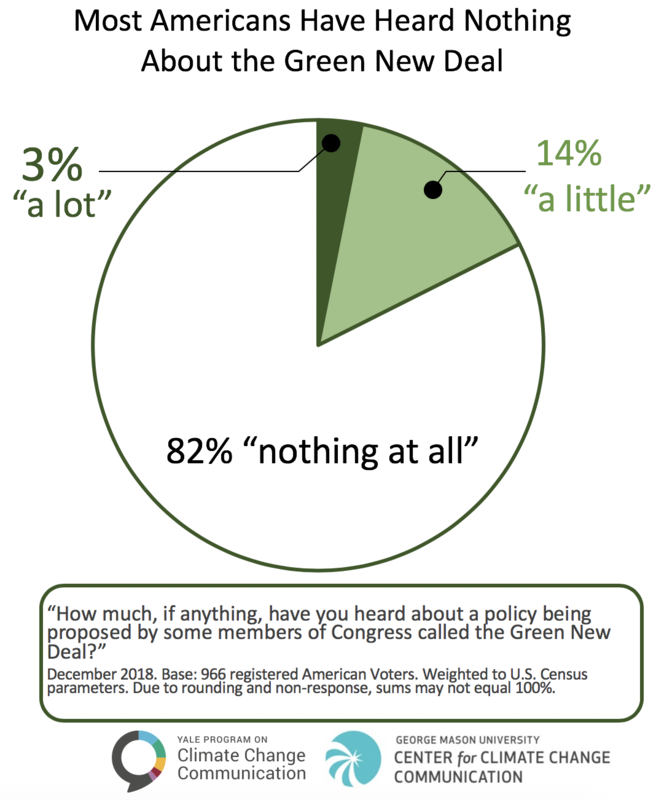 In fact, 82% of registered voters had heard “nothing at all” about the Deal. One potential implication is that partisan polarization about a Green New Deal could increase in the future. Going forward, the Deal will likely require bipartisan support among political and media elites to maintain existing bipartisan support. This nationally-representative survey also measured Americans’ opinions about many other aspects of climate change, climate policy, and renewable energy, and assessed how opinions vary by demographics and ideology. Additional findings from this survey will be published in a series of reports beginning in January 2019. Surveys were conducted using the Ipsos KnowledgePanel®, a representative online panel of U.S. adults (18+), from November 28 to December 11, 2018. All questionnaires were self-administered by respondents in a web-based environment. This report includes the registered voters (n=966), from the full sample (n=1,114). Unweighted base sizes for the political subgroups are as follows: Democrats (n=466; liberal Democrats n=295, moderate/conservative Democrats n=168), Republicans (n=356; conservative Republicans n=238, moderate/liberal Republicans n=116), Independents (n=95). Average margin of error for both the full sample and registered voter subset: +/- 3 percentage points at the 95% confidence level. The margin of error for each political subgroup is larger. Bases specified are unweighted, but percentages are weighted to align with U.S. Census parameters. For tabulation purposes, percentage points are rounded to the nearest whole number. As a result, percentages in a given chart may total slightly higher or lower than 100%. Additionally, summed response categories (e.g., “strongly support” + “somewhat support”) are rounded after sums are calculated (e.g., 1.3% + 1.3% = 2.6%, which, after rounding would appear in a chart as 1% + 1% = 3%). Gustafson, A., Rosenthal, S., Leiserowitz, A., Maibach, E., Kotcher, J., Ballew, M., & Goldberg, M. (2018). 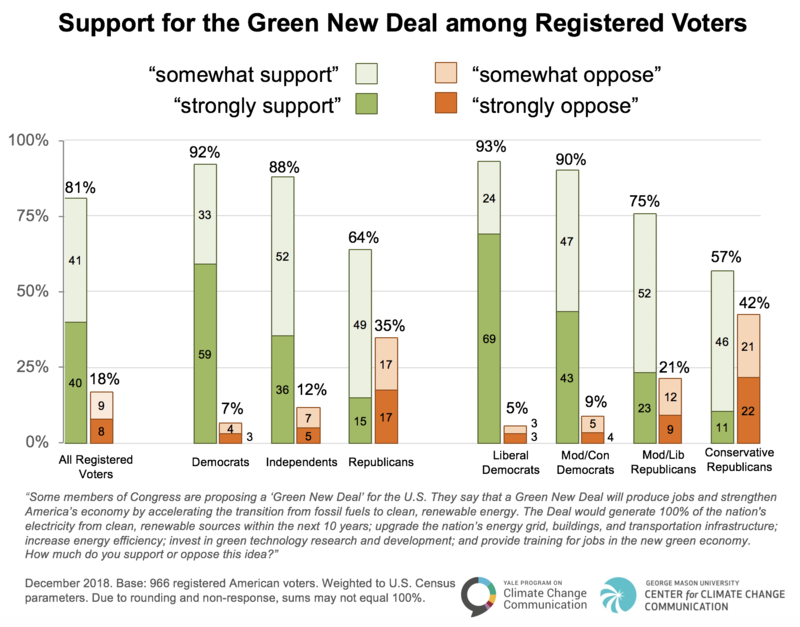 The Green New Deal has Strong Bipartisan Support. Yale University and George Mason University. New Haven, CT: Yale Program on Climate Change Communication.